A new competition is offering you the chance to win a unique prize on All-Ireland football or hurling weekend. Famous GAA commentator Mícheál Ó Muircheartaigh. ALWAYS DREAMED OF commentating on the summer’s biggest football and hurling matches? Well the GAA, in conjunction with RTE Raidió na Gaeltachta, are offering aspiring commentators to send in a 60 second clip of them at work (as Gaeilge) with the best ones being chosen on August 9. The winning entrant will be awarded with two tickets for either the All-Ireland football or hurling final as well as a two-night stay in the Croke Park Hotel and access to the commentary box on the day. Commentating is my absolute dream job and I get goose pimples when Amhrán na bhFiann rings out before the matches. I’d say to people interested in the competition to give it a try. Send your 60-second clip as Gaeilge to ct@rte.ie, or by post to Comórtas Tráchtaireachta, RTÉ Raidió na Gaeltachta, Casla, Conamara, Co. na Gaillimhe. Closing date is 9 August. Include your name, address and phone number. Entries are open to men and women over 18 years of age. Email “Calling all aspiring GAA commentators…”. 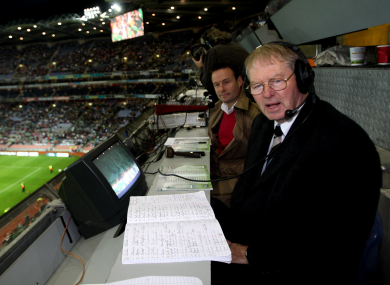 Feedback on “Calling all aspiring GAA commentators…”.